No more Ultraman, no more Disney Cars, no more Thomas and Friends, nothing. 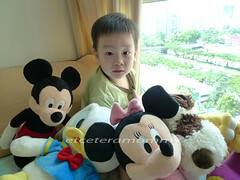 His utmost favourite character (for now) is Mickey Mouse ClubHouse. 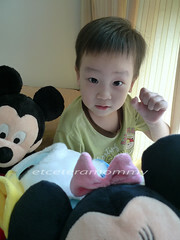 At aout 6am, I could sense him tossing on bed again. True enough, he started crying (eyes closed), kept mumbling he wanted to watch Mickey Mouse show. Arrrghhhh……. At 7am, the alarm rang. I was reluctant to wake up. Ryan was obviously sleeping like a log. I told hubs Ryan is skipping school. Bravo. We all went back to sleep for another sweet half an hour. I got extra 15 minutes because I don’t have to get ready for work. Yay! I came home around 9am after fetching hubs to work. Guess what, the little monsterÂ was still sleeping…..Â I woke him up and told him he missed school because he overslept. He was sad… sad not because he’s missing school.. he told me.. “No school? I cannot play with Brooklyn?”.. Yes.. Brooklyn is his best friend in school now. Anyway, few days later, I saw a similar set selling at Kiddy Palace. It’s of different brand but it is more complete. 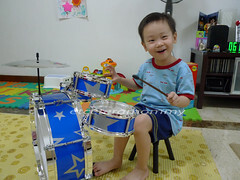 ItÂ comesÂ with additional one toms and 1 snare drum at the side for just a fraction of the price at $25.Â Â Toys in KL are so so expensive.